Here we are at the end of May. A scant 75 days to GenCon 2014, and the official premiere of my GenCon Module. Development is coming along, as is the process of turning my three pages of bullet points into something resembling an actual adventure write up. Testing is going well, too. I'm learning a lot about my NPCs, and the PCs I've been making. One item that's become readily apparent is that the tanks are, well, tanks. They're stomping around with high Wound Thresholds and high Soak values, taking all comers and dealing out massive damage. Bowdarr and Lord Scourge are the worst offenders; and I'm pretty sure Qyzen's going to add to that list. I've been making passes at the stats, adjusting them and tweaking them for better balance. There is going to be a disparity between characters, that's apparent. Some characters are simply going to be better in certain areas, and have more effective XP than others. Still, as long as the character is effective, it should be okay. The trick, tho; I have to make this module matter to everyone in the party regardless of their role. Combat, social, skill challenges; the characters that are focused on more social aspects need to feel as useful and helpful as the ones like Scourge and Qyzen who will wallop anyone up against them. That's going to be a trick; I look at my adventure path and it's a pretty straight line. I need to include opportunities for more paths to the pivotal encounters. Some combat, sure, but also a possibility for diplomacy, deception, and investigation to move the story. But first, one last group to write up stats for. As previously stated, Qyzen is a beat-stick. He's got his vibro-greatsword and the talents to annihilate anything that comes up against him. I'm actually thinking about removing a rank of Feral Strength and Frenzied Attack, just so he doesn't out DPS the DPSers. 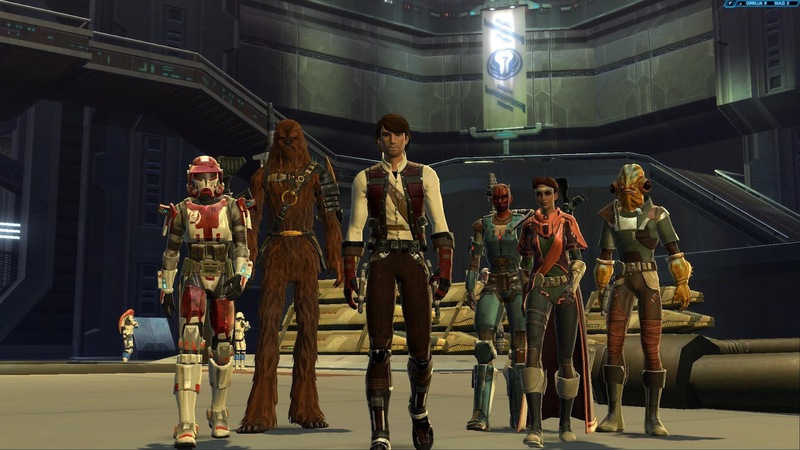 Then again this is a module inspired by the companion character's role and story in The Old Republic. Qyzen is a devoted hunter and a terror to face in combat. Plus he worked pretty well as a damage dealer for my Consular in the game, so he could do the same here too. I've pondered making him as a Big Game Hunter spec from Enter the Unknown to see what he'd look like. Qyzen would lose a bit of tanking ability, but as a party support character it may work out better. It's something for me to consider. Tharan and Holiday are an odd pairing to be sure. He's a brilliant scientist who's fallen in love with his creation; his super-computer holographic projection, Holiday. And she loves him back. How this relationship works is beyond me, but apparently not Hollywood. In game, Holiday is the mechanism for Tharan's Medic-ability to put opponents in a fragile hold for 10 seconds. Holiday appears next to a target and dances seductively at them, dazing them. An interesting ability to try to port over to a game, so I gave it a try and gave Tharan a unique ability. "Holi-daze": Tharan can project Holiday towards a target out to Short Range and attempt to distract or daze the target. Make a Computers check opposed by the target's Cool skill. One success is needed to "hit" the target. Three Advantage can be spent to immobilize the target until the start of Tharan's next turn. Triumph can be spent to Stagger the target until the start of Tharan's next turn. If the target takes any wound damage before the beginning of Tharan's turn, the effects end immediately. As a scholar, Tharan is a passable medic, a social protege, and a knowledge-skill titan. He'll be useful in combat, but players will find more mileage from him by utilizing his non-combat skills in every situation they can. This also brings up a disparity between role in the game and roles in the tabletop incarnation; a similar one as Guss Tuno from the Smuggler Crew. Tharan's skill set and background don't really fit the role of "Team Medic" very well, and yet that's the role he plays in the Consular's party. 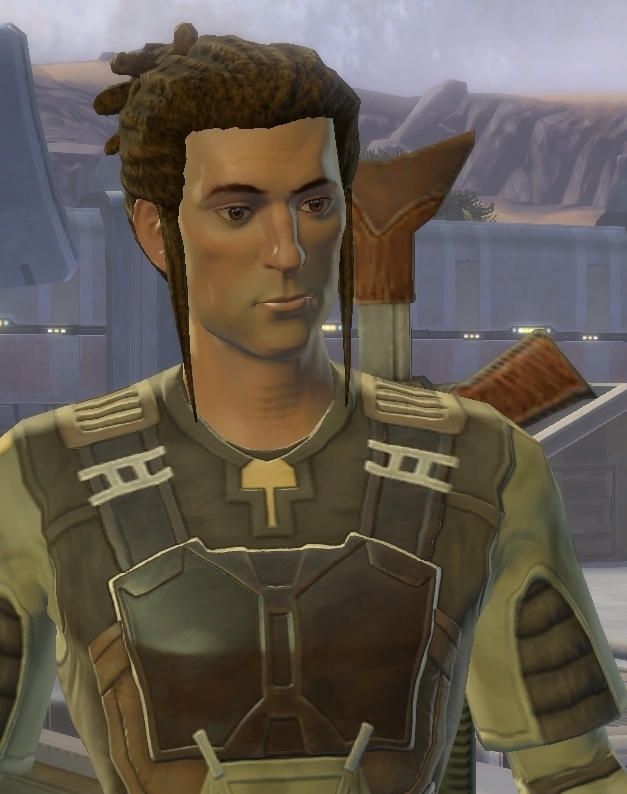 Since this module is more focused on the characters, and less on their SWTOR roles, Tharan merely dips into the Medicine ability and mostly focuses on his back-story as a brilliant scientist. Zenith is a simple concept; build a sniper. Pure DPS from start to finish, he's as basic a character concept as Bowdarr. He does have some uses outside of combat, it's always good to have a character that can utilize stealth in a party. But at his core, Zenith is all about finding that perfect position to bring down the opposition with a well placed blaster bolt from across the battlefield. 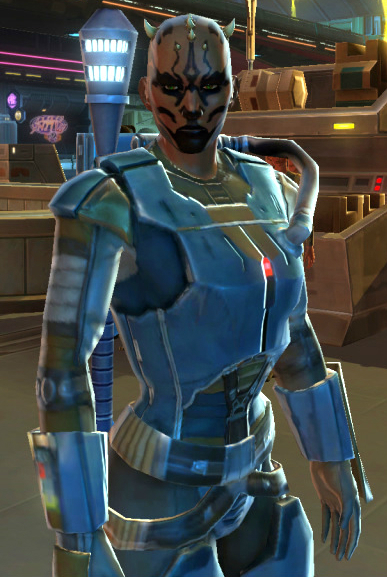 His rifle will be tricked out with some mods, but no where near as much as Risha Drayden's. She's got a couple talents affecting her rifle anyway. Zenith's lethality is based off his innate talents, where Risha's is based on her technical prowess. Felix is kind of a better-liked Corso; possibly due to the fact that he isn't as annoying. The only character in the Barsen'thor's party who translates as a Career from Age of Rebellion, Felix fills the role of a Ranged Tank. Much like his counterpart in Havoc Squad, M1-4X, Commando seems to be the perfect tree for this gun-toting bruiser. His soak value isn't that high, but his Wound Threshold is respectable, as is his ability to shrug off critical injuries. I didn't feel that a high Brawn fit Felix; although I could make a change for the sake of his Soak and Wound Threshold. Brawn is both strength and toughness, and Felix is a tough customer. Felix is best utilized laying down fire with his blaster rifle, drawing attention away from the squishier members of the team. Ah, Nadia; I felt so creepy romancing you while playing the Consular. Probably because I thought of my Consular, Dunne, as my age. And Nadia's like...17. She seems that way, anyway. And a padawan. My padawan. Nadia is built for close range damage. Legally, to be able to deal damage with Move she needs to have one Range upgrade. I'm tempted to remove it for the sake of the module, and give her a Magnitude upgrade instead (allowing her to affect multiple targets at once). That would probably fit better. I mean, I could do both, but she didn't really use telekinesis much at range. She's a close-in fighter, I sort of would like to encourage that. I had originally planned to run one of the final sessions of my Order 65 campaign in mid-June. Due to some conflicts with the players, I'm going to run my players through the module. I have to start testing it now. I have no clue how many times I'll get to run and tweak the module before GenCon, so I'm going to grab every opportunity I can. And every run should make the final product better. Going to be a bit of a quick post this week. I've been having some good luck with my GenCon Module, and the playtesting of the highlight encounter. I've actually got another test run Wednesday night with the Smuggler Companions. Should be a hoot. I didn't quite realize how much of a monster I made Bowdarr. Meh, that's okay. Risha's actually pretty obscene too with her tricked out Blaster Sniper Rifle, with mods and Jury-Rigging and Tinkering. High damage, high accuracy, Pierce, low Crit Rating; not too shabby for an Outlaw Tech. But the big thing I wanted to talk about is another secret project I've been working on for most of the year, but couldn't talk about it because my brother reads this blog. 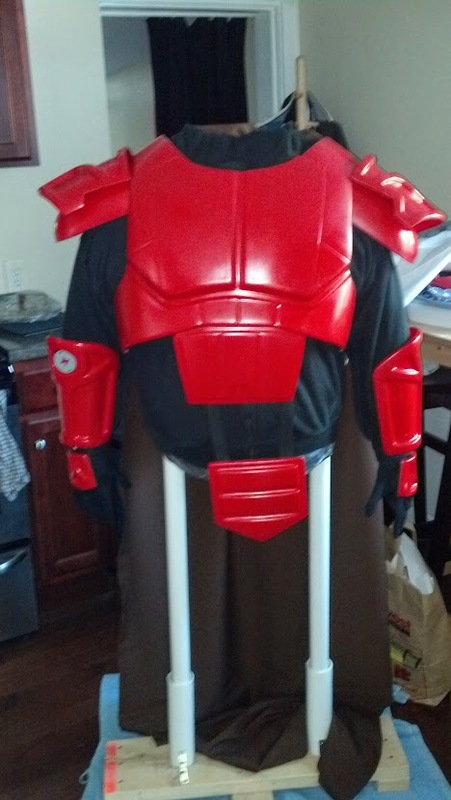 He got married this past weekend, and me and a few others got together and picked up a suit of Imperial Knight armor for him to finish off and get approved for the Rebel Legion. I had some trouble working on it until the weather got decent in New Hampshire...which was sometime around the first weekend in May. 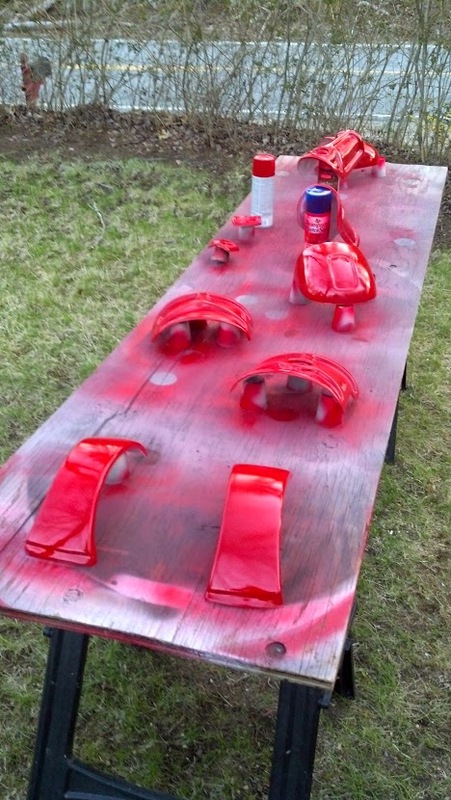 Prior to that it was either too cold or too rainy to spray paint. So anyway, three coats of red, and eventually will put on a coat of clear protective glossy to preserve the finish and give it a nice shine. I ran out of time so I sort of put the armor together haphazardly and mounted it on my duct-tape dummy that I have. It still needs the undersuit and belt. And the cape is just the material draped over it, not really sewn into it's proper shape yet. Still, it's progress towards getting my brother into the Rebel Legion with an Imperial Knight. Actually, the 501st Legion also recently approved this outfit for membership. It's a good guy, but it's an Imperial Knight. Got the cogs and everything. It falls under the "TR" designation for the Flagship Eclipse Detachment (basically the place for all the Expanded Universe costumes). Let's see how long it takes my brother to get this finished. I'd love to see him as a Rebel Legionnaire by the end of the year. It's been a crazy week in the world of DarthGM. My brother is getting married this coming weekend, and I'm the Best Man. The week has been filled with travel seemingly all over New England, preparations, machinations, and execution of several surprises. In the meantime, I've made progress on the pivotal encounter in my GenCon Module. Two playtest sessions under my belt has led to some good data-mining and feedback on mechanics and character stats. I'm debating going into more detail about the encounter, although I suppose it's kinda out there now as to what it is. Still, I'll keep it "officially" under wraps for a later date. 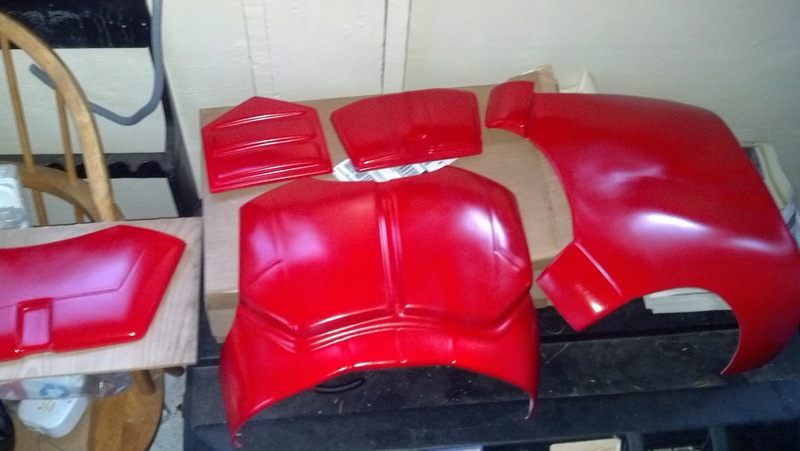 The costuming bug has bit me again, and I've started work on utilizing those foam mats that I have taking up space in my house, purchased so many years ago for a Darth Malgus build. Inspired by a construction thread over at the RPF, I'm starting work on my own SWTOR Jedi Knight outfit utilizing EVA Foam and Pepakura files. With the right files, the foam, and a few layers of Plasti-dip, you can make some really impressive costumes. A bevy of Iron Men have cropped up over the past few years, and a whole host of Specters from Mass Effect, all thanks to the skillful manipulation of those rigid-foam mats folks use to protect their floors from machining equipment and exercise contraptions. The work is AMAZING, a lot faster than other costume making methods, and a lot cheaper too. The amount of mileage and wear and tear they can take is much less than hard-plastic counterparts, as expected, but it's also a lot easier to make replacement parts. I've printed out and assembled the files for the bracers for the Jedi Knight. I'd like to make the foam bracer sometime next week, and if that works print out and assemble additional parts for construction at an upcoming Build Day. Ideally, I'll be making the Jedi Knight to get practice with Pepakura and EVA foam construction, and repeat the process to make the Sith Acolyte. They use almost the exact same armor templates, just that the Sith Acolyte will require the acquisition of an appropriate mask. If I do it right, I might be able to submit the Acolyte for 501st Legion approval. You may have noticed a theme with my sub-headers today. I'm on Twitter now. It's weird, and not really conducive to my usually-long-winded approach when it comes to writing out my thoughts and arguments, but it is handy to keep in touch with things. We'll see how it affects my blog, using #FragmentsfromtheRim and #FFTR as hash-tags for this column. Feel free to follow me over there, I'm @DarthGM. 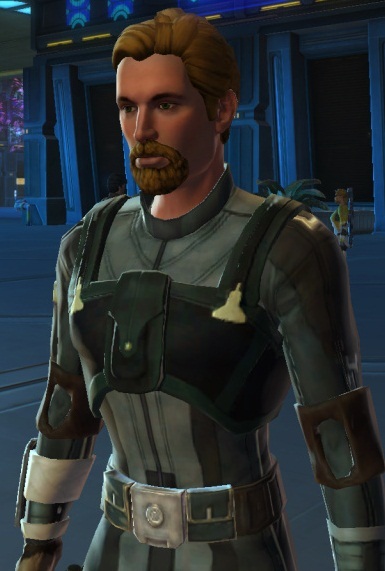 Maybe next week, after the craziness of this week, I can finish off the Jedi Consular's team and post up their stats, and come back with revisions for the previous posts. With any luck, tonight will be the first opportunity to playtest my Havoc Squad group in one of the signature encounters for the module. I've got a few folks from my feed on Facebook who are jumping online with me tonight to run the fight, and I've got a few more lined up for next Tuesday. Based on who will be there Tuesday, I might have them play the Heroes of Tython companions. But that's later, this is now. MOAR CRUNCH! Oh Corso. Poor Corso. The Rodney Dangerfield of the Companion Characters; you get no respect at all. I think a lot of it stems from one of your powers back in Beta, where you would use a grappling gun to pull targets to you to fight. While you were standing next to the Smuggler hero. Who was in cover. And who's survivability mostly hinged on keeping well away from as much combat as possible. That and you come across as one of the duller knives in the drawer. That didn't help either. And your dreadlocks look ridiculous. Get a haircut, you hippie. Anyway, for the module, Corso actually will bring a lot to the table if the player can survive my theory of being the second-most-mocked PC at the table (Who's #1? You'll find out someday...) He's the Ranged Tank for the Smuggler, so I gave him the Hired Gun/Bodyguard tree. His background as a tech and assistant for various underworld elements warrants knowledge and connections in the seedier side of the galaxy. Corso has a utility-belt-full of defensive talents to keep him protected, allies harder to hit, his head clear of disoriented or staggered status conditions, and hammer foes at Long range. I'll admit that my exposure to Risha (and the later companions) is limited. I know some of her story while teaming up with my brother's smuggler while I was playing my Trooper. From what I've been able to gleam from her story in game and what's been revealed online, she's got quite a background in criminal espionage, underworld ties, and proficiency with mechanics. Outlaw Tech from the Technician Tree felt like a good fit for her. I also abused her Human racial abilities to give her some non-career skills that fit her story. There was some disconnect, or at least some creative license with Talent selection when compared to her "role" in the game. She's supposed to be the Ranged Damage character, but Outlaw Tech doesn't really have a lot to offer there. Not directly anyway. However, if one were to think just outside the box there's actually a fair bit in Outlaw Tech to support this. Brace is a perfect talent for a sniper, and Jury Rigged reflects Risha's preference for custom weapon modifications. Defensive Stance and Side-Step will help her as she moves from one vantage point to another. In the end, this concept also supports the theory that the FFG system can support someones role just based on skill use, and doesn't always need a large amount of Talents to support that role. But hey, that's what testing is for. 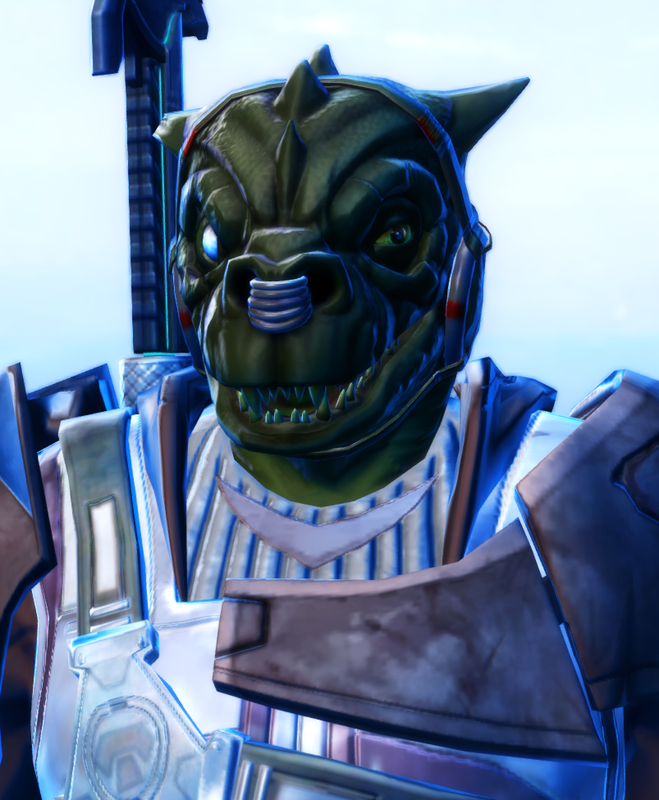 Possibly the least "off-the-beaten-path" character for this group; Bowdarr is a Wookiee Marauder. Scores of Wookiee Marauders have graced gaming tables since the Beta Release of Edge of the Empire, and scores more once the Beginner's Game was released. Bowdarr follows in that tradition with all the skills you'd expect, and all the talents you'd expect. Bowdarr's job is to be a tank; he's supposed to get up into somethings face, draw their attention, and ruin them if they don't. The only thing that's going to slow Bowdarr down is his Strain Threshold; 11 really isn't a lot for extra Maneuvers, or activating Frenzied attack and Defensive Stance. The player is going to have to hope for a lot of Advantages on the dice to burn off the Strain Damage he will undoubtedly endure. I know less about Akaavi Spar than I do just about any other companion in this group, possibly in the game entirely. From what I've read, she's that last of a murdered Mandalorian Clan. A mercenary and a bounty hunter specializing in melee combat, the Gadgeteer felt like a natural fit for her. Like Bowdarr, I didn't give her too much outside of the Career for skills, and embraced her projected persona of the cold Mando Merc. The player of Akaavi will want to get into combat as quickly as possible to increase the chance of triggering her Stunning Blow and Crippling Blow talents. Her Armor Master talents should keep her relatively safe. I could have given her Heavy Battle Armor, but I've tried to limit that stuff to Tanks, and keep the damage dealers in more squishy armors. Still, with her Armor Master talents, Akaavi's Laminate Armor takes on the qualities of Heavy Battle Armor, even more-so. Looking at her final numbers, I don't feel that it will be an issue, or cause her to be a better tank than Bowdarr or Corso. It'll add to her survivability, but she's still more squishy than those other two. Force Powers: Influence (Make an Influence Power Check when guiding or shaping thoughts, Dark Side Points can be used to generate negative emotions, Light Side Points can be used to generate positive emotions. Confusion can be generated with either. 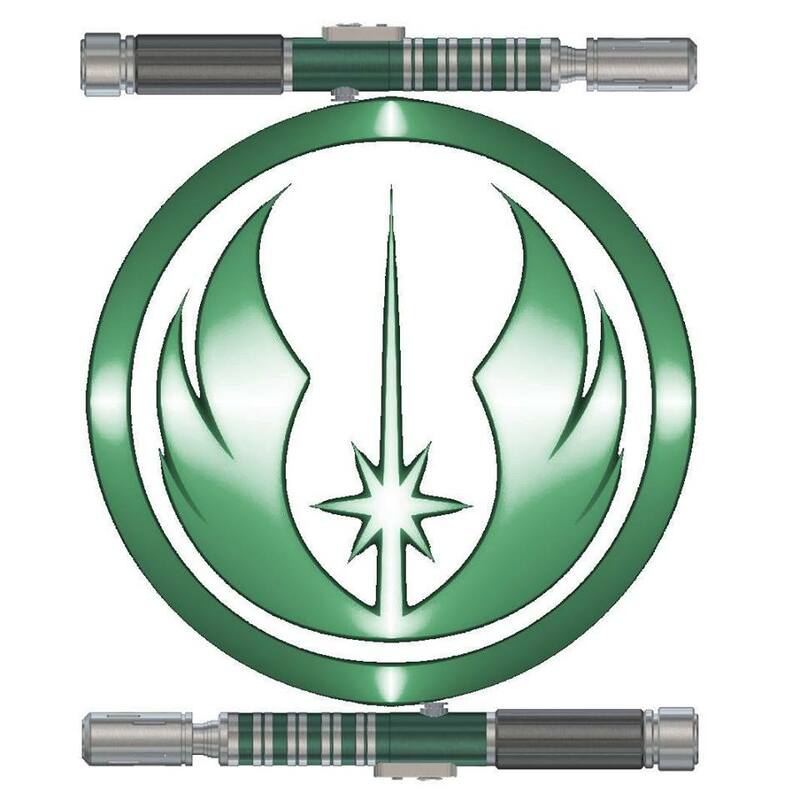 Force Point can add Success or Advantage to Coerce, Charm, Deception, Leadership, or Negotiation checks, Force Point to increase range once, Force Point to increase number of targets by 1, Force Stun- Make an Influence Power Check; 1 Force Point inflicts 2 strain to target at Engaged range. Guss was an absolute surprise. I didn't know the Smuggler's crew had a Force Sensitive character, never mind a Con Artist. 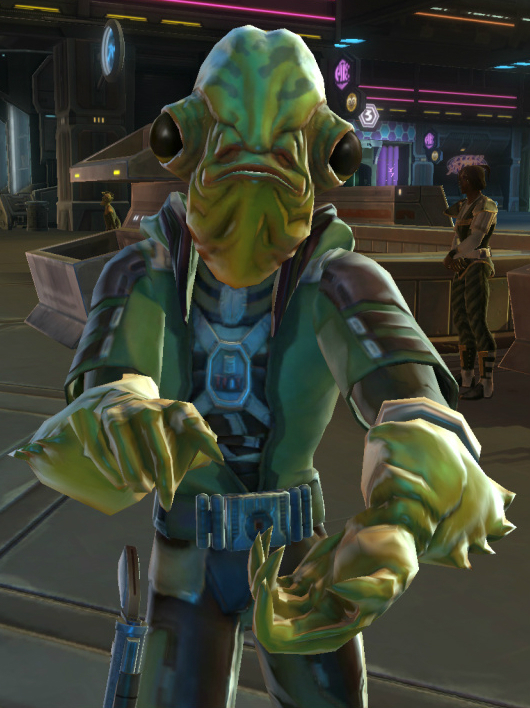 Guss is the healer for the Smuggler's crew, but I think that's mostly by default. Given his background, he probably cons the victim into thinking he's healed more than he is. Still, he's supposed to be fulfilling a needed role in the party, so he is a serviceable medic. Guss's real talent lies in deception and social combat. He's gotten by in life by living the con, and his abilities here help that. With his social prowess and Influence Force Power, I can see Guss being the face-man in the "Voidhound's" absence. This write up also reminded me of something else all the healers had; the ability to put an opponent into a Fragile Hold. Doc and Elara used a wrist-mounted carbonite projector. Tharan Cederax will have Holiday (his holographic mistress). I don't know if Guss uses the same carbonite projector as the other healers, but I think his should be tied with his Force powers. Influence gives us a good use for that by having one of the extra uses be a Force Stun attack. Now Guss can smack a target at Short range for 2-6 strain, depending on how well he rolls with no attack roll needed. That will slow down an opponent, and may even drop an exhausted one. Now, however, I have to go back an make a Carbonite Projector. I'll probably have it be something that deals a small amount of Stun damage, has the Ensnare quality to immobilize a target, and can hold the target for 1 round with a Triumph. This crew doesn't look too bad, all things considered. I'm looking forward to seeing how this crew of Edge of the Empire exemplars handles themselves in the adventure I have planned. Oh, and as stated before, if anyone out there has any insight into these characters, and sees things in their skill-set that I'm missing, please let me know.